Issued 36 to 48 hours before Mauritius or Rodrigues is likely to be affected by gusts reaching 120 km/h. Issued so as to allow, as far as practicable, 12 hours of daylight before the occurrence of gusts of 120 km/h. Issued so as to allow, as far as practicable, 6 hours of daylight before the occurrence of gusts of 120 km/h. Issued when there is no longer any risk of gusts exceeding 120 km/h. Low pressure area: Region of the atmosphere in which the pressures are lower than those of the surrounding region at the same level and where the cloud masses do not appear to be organized. Extra-tropical disturbance: Synoptic scale low pressure area outside of the tropics or former tropical disturbance having lost its tropical characteristics. could belong to both tropical and extra-tropical depressions. In the South West Indian Ocean, the genesis of such system is regularly observed over the South of Mozambique Channel. Zone of disturbed weather: Non-frontal synoptic scale low pressure area originating in the tropics or sub-tropics with enhanced convection and light surface winds. Tropical wave: Trough or cyclonic curvature maximum in the trade wind easterlies or equatorial westerlies. The wave may reach maximum amplitude in the lower middle troposphere, or may be the reflexion of an upper-troposphere cold low or equatorial extension of a mid-latitude trough. Tropical depression: Tropical disturbance in which the maximum of the average wind speed is estimated to be in the range 28 to 33 knots (51 to 62 km/h, force 7 in the Beaufort scale). Moderate tropical storm: Tropical disturbance in which the maximum of the average wind speed is estimated to be in the range 34 to 47 knots (63 to 88 km/h, force 8 or 9 in the Beaufort scale). Severe tropical storm: Tropical disturbance in which the maximum of the average wind speed is estimated to be in the range 48 to 63 knots (89 to 117 km/h, force 10 or 11 in the Beaufort scale). Tropical cyclone: Tropical disturbance in which the maximum of the average wind speed is estimated to be in the range 64 to 89 knots (118 to 165 km/h, force 12 in the Beaufort scale). Intense tropical cyclone: Tropical disturbance in which the maximum of the average wind speed is estimated to be in the range 90 to 115 knots (166 to 212 km/h). Tropical disturbance in which the maximum of the average wind speed is estimated to exceed 115 knots (212 km/h). Remnant low: A former tropical system that has weakened and is no longer associated with established and/or organized convection. Within the related low-pressure circulation the maximum estimated average wind does not exceed 27 knots (50 km/h, force 6 on the Beaufort scale). Filling low: A former tropical system undergoing sustained weakening and whose related minimum pressure is raising. Dissipating low: A former tropical system in the final decaying phase that is doomed to vanish rapidly. Post-tropical depression: A former tropical system (tropical depression, tropical storm or tropical cyclone) in the extra-tropical transition phase, which no longer presents all the characteristics of a tropical system but has not yet completed its transition and cannot, therefore, be considered an extra-tropical depression and qualified as such. This is usually a transient stage lasting in most cases less than 24 hours. Centre of the tropical disturbance: Geometric centre of the cloud eye or, if not discernible, the wind/pressure centre. Eye of the tropical disturbance: Relatively clear and calm area inside the circular wall of the convective clouds, the geometric centre of which is the centre of the tropical disturbance. Direction of movement of the tropical disturbance: Direction towards which the tropical disturbance centre is moving. Speed of movement of the tropical disturbance: Speed of movement of the centre of the tropical disturbance. Storm tide: Actual sea level as influenced by a weather disturbance. The storm tide consists of the normal astronomical tide and the storm surge. Storm surge: Difference between the actual water level as influenced by a meteorological disturbance (i.e., the storm tide) and the level which would have been attained in the absence of the meteorological disturbance (i.e., astronomical tide). Storm surge results from the shoreward movement of water combined with the comparatively minor effects of low barometric pressure. The system of naming tropical cyclones was introduced in 1960, which will be remembered as the year during which Mauritius was struck by cyclone “Alix” and by cyclone “Carol”, the most devastating cyclone on record. Madagascar, Reunion, Seychelles, Comores, and Mauritius use a common list of names for identifying tropical storms. Mauritius is responsible for naming storms forming in the region lying between longitude 55ºE and 90ºE. Madagascar is responsible for the region west of longitude 55ºE and the Australian Bureau of Meteorology for the region east of 90ºE. Whenever a cyclone moves from the Australian region of responsibility to that of Mauritius, it keeps its Australian name as per decision of the Tropical Cyclone Committee held in Nairobi in 2010. 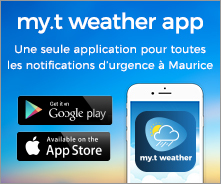 © Copyright Mauritius Meteorological Services.